Everyone knows the superstars of self-publishing, but many others are earning a living, selling foreign rights, and being courted by traditional publishers. 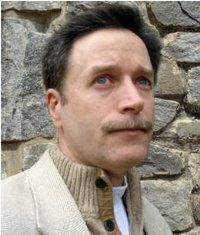 The author's husband, Michael J. Sullivan, self-published on Amazon and went on to sign a six-figure contract with Hachette. There have been many articles about self-published superstars like Amanda Hocking, Joe Konrath, and John Locke. While these success stories are noteworthy, we should look at them for what they are — outliers in the self-publishing world just as Stephen King and Stephenie Meyer are outliers in the big-six publishing industry. Most authors can never hope to reach sales in the hundreds of thousands for a single month, but there are more than a few who sell anywhere from 800 to 20,000. While selling books at this level would seem extraordinary by traditional publishing standards, the mere fact that so many self published authors have achieved this goal (with more being added each month), indicates that it is not an unusual occurrence. Not only are these new mid-listers selling a lot of books, but they are also receiving significantly more money from each sale (the industry standard is a 25% royalty of net sales for e-books under contract by a big-six publisher). If a self-published author sells their book for $2.99 – $9.99, then Amazon will pay 70% ($2.09 – $6.99). Compare this to the $1.22 per book income (which needs to be shared with an agent) for a $6.99 e-book sold through a publisher. High volume combined with good revenue is providing self-published e-book authors five and six figure yearly incomes allowing them to quit their “day jobs” and make a living by doing what they love most–writing. I regularly give lectures on the different options for publishing and up until recently my main point about self-publishing was the unprecedented control it provided. Recently I’ve had to change my presentations to also acknowledge that if you wish to maximize income then self-publishing, if done well, could provide the best revenue potential. A year ago I was definitely not making that statement — but a watershed moment occurred in October/November 2010. It was at this time that sales of e-books from previously unknown authors skyrocketed. Of these authors, only Victorine Lieskie ever had a book that made the Amazon Top 100 Bestseller List. 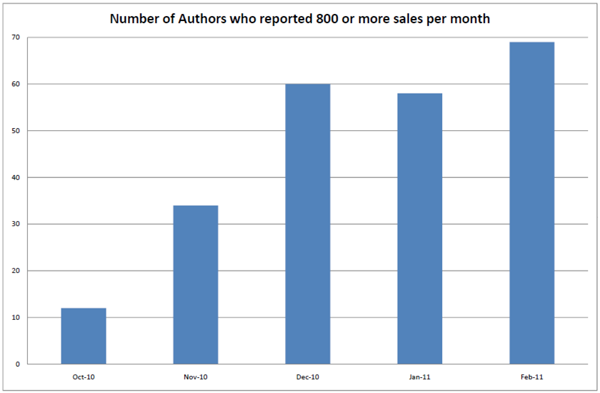 Most of the authors selling at a rate of 800+ books a month tend to have rankings from 300-6,000. (A ranking of 1001 indicates that 1,000 kindle books are selling better than yours). Many detractors of self-publishing point out that by doing so you close the door to foreign sales and any chance of ever seeing your books on a bookstore shelf. Again, this was true in the past, but times have changed and now being successfully self-published actually opens the door to foreign sales and provides a better chance of being signed by a major publisher since you already have an established audience which is so important in publishing today. Let’s return to Michael as he is an example that I have real data for. 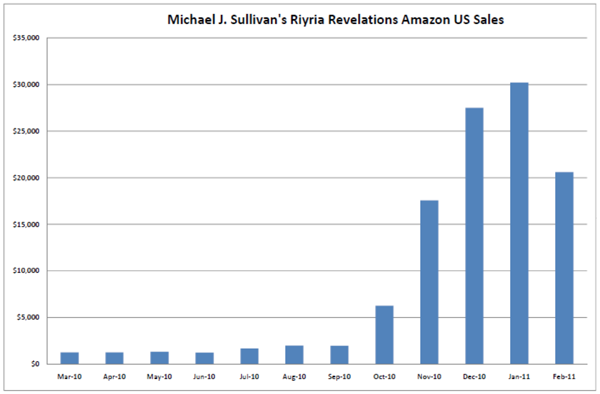 The Riyria Revelations produced $154,000 in foreign translation rights sales in just the last six months. Deals are already finalized for: The Czech Republic, Russia, Germany, France, Poland, and Spain. Active negotiations are ongoing for Holland and Italy. Once more, the Writer’s Café forum demonstrates that this has not been occurring just for Michael. The following are authors who have announced either signing a foreign deal, or being approached by an agent or publisher for foreign rights translations: David Dalglish, Shelley Stout, M.G. Scarsbrook, Tina Folsom, Melanie Nilles, Dawn McCullough White, Victorine Lieskie, Imogen Rose, Lucy Kevin, Margaret Lake, Terri Reid, and Beth Orsoff. As for seeing your books in the bookstores…it is true that most brick and mortar stores will not carry self-published printed books, however, major publishers are very interested in authors with an existing fan base. What’s more, they have to offer larger advances than those paid to debut authors in order to woo them. A self-published author already has a pretty good idea what they could make from the works if they continue to stay independent. For a debut fantasy author, several surveys indicate an advance of $5,000 – $10,000 is standard. So a three-book deal would warrant $15,000 – $30,000 advances. In comparison, Michael was offered a six-figure contract from Orbit (the fantasy imprint of Hachette Book Group). Other self-published authors who have recently been signed include: H.P. Mallory (six-figure advance from Random House), D.B. Henson (who was approached by agent Noah Lukeman -– that’s right she did not query him…he queried her) whose Deed to Death sold at auction, Stephanie McAfee’s Diary of a Mad Fat Girl, Jerry McGill’s Dear Marcus, R.J. Jagger, and a book by Quentin Schultze & Bethany Kim. The publishing industry is certainly changing at the speed of light. There used to be only one choice if you wanted to make any decent money writing novels: spend months (or years) querying for an agent, waiting months (or years) while that agent shopped the project around, and then if accepted, waiting up to two years for the book to actually hit the store shelves. If your book wound up on the midlist (which by definition most did) then low volume and a small cut of the books total sales price made it financially impossible for authors to write full time as their sole source of income.